Everyone knows what it is like to feel afraid. Especially in our modern world, fear stalks our hearts and lives in many forms. The nightly news and our conversations with friends and family fill us with foreboding. We fear losing our jobs, harm coming to our children, medical issues that may change our lives permanently, and crime that affects the innocent… particularly sexual and physical abuse. We fear for the safety of our loved ones and our nation in an unstable climate. Daily we hear about national disasters and other tragedies over which we have no control. Fear paralyzes our ability to think rationally, act with decisiveness, and take positive action. 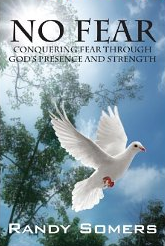 No Fear shares the inspiring message that fear can be conquered! Explore the scriptures that will calm your heart, lift your spirit, and replace your fear with strength, courage, and love. May our Lord Jesus bless each of you as you read No Fear along with your Bible. May our Lord grant each of you courage to face the difficulties of your life. May No Fear, with its compassionate wisdom, be a guide to you on your path to joy.